The location was a little further back then we were hoping for. The cabin is beautiful I actually am looking to build a loft and this placed just confirmed what I want. The WIFI was not the best it kept going in and out but hey your in the woods it happens. Whoever cleans the outside of the cabin need to clean a little better there was trash all in the bushes and on the ground. Even though there were some flaws I still love the place wish I could have the cabin on my property. Overall great cabin for the price. The only thing I would change is that it says it is located between pigeon forge and gatlinburg but it isn't. The address says severville but GPS will tell you Gatlinburg. It is about a 20 minute drive to Pigeon Forge. We didn't get enough towels even though I said their would be six adults. My family and I had a great time. We are planning to visit Pigeon Forge again and we will be staying in the same cabin. Great place to stay! Once again it was awesome. Only issue was reservations listed s Sevierville address and our app would only bring up a Gattlinburg. Cabin was so nice and had everything we needed. Made our girls trip even better. We had a great time in the cabin enjoyed the yard it has and the swing and rockers on the porch. The hot tub was nice and we had fun playing the arcade game. It is close to everything but feels far away and secluded and that is what we were looking for. The beds could be a little less squeaky and softer but over all it is a great cabin and would stay there again. We stayed 4 nights and it was great! My only complaints would be that the furniture (couches) are about worn out, some mildew in the downstairs shower and it had an odor down stairs. (Maybe a small dead rodent). I would definitely stay here again. Thank you for making our trip one to remember. This cabin was pretty and relaxing. Only got to stay a day and a half. But it was well worth it!! Thank you cabins USA!! Hope to stay in your cabins again!! Great cabin. Loved the location. Was very pleased to find the entranceway as well as the interior space had been decorated for Christmas. It was a nice surprise. Very welcoming and homey. Such a fun cabin! Perfect for our group of 6. The hot tub was kind of wonky, we only got to use it one of the 3 days because it was cold when we got there and cooled down a lot after we used it. The cabin was exactly what we wanted. More than enough room for the 3!of us. Totally secluded. The only downfall was the lack of internet. Had a great time! We stayed for a week , only problem was outside lights in back didn't work ,made it hard to grill. Also needs new fire pit, the one there is falling apart.Other than that everything was great , plenty of room in cabin with everything we needed. Thanks for a great vacation . The cabin can benefit from some upgrading , specially the bathrooms , lines, and carpet . The hot tub took exactly 24 hrs to heat up. This is a main attraction and when guest arrives it should be on and hot and ready to be used. I️ was not able to use iit until late afternoon the next day. We thoroughly enjoyed our stay at the cabin. We had to have maintenance out a couple of times but no big issues. The only thing I wasn't pleased with and was actually concerned about until we got to the cabin was the fact that when I made reservations, they would not give any information as to where the cabin was (none). They said it was for safety reasons. We had never had anyone do that before. I actually regretted making the reservations until we got to the cabin and made sure it was what we reserved from the pictures. No regrets now. My husband and I were there with my 2 sisters and their husbands and we had a great time. We'll for sure be staying there again. Thank you!! Was a great, convenient location to G'burg. Secluded and peaceful. Only disappointed that the wi-fi wasn't really great, as it wouldn't connect inside the cabin, and the Hot tub had temperature issues (more like a warm tub). Everything else was great! Fire pit and outside grill was a plus!! Just a couple things to mention... there is a mildew/mold issue near the tub in both bathrooms. It's small but needs attention when cleaning. The fireplace will not work. We had a couple chilly mornings and would have really enjoyed the fireplace, but turning on the timer as described in the instruction book did nothing. I'm guessing the gas was turned off somewhere. My family and I stayed from Thursday to Sunday. We did the Express Check-in and Express Check-out. It definitely was a breeze. We had an issue with the satellite and a place broken on the loveseat when we checked in. I called the office and they sent someone from maintenance shortly after my call. The cabin was nice and very relaxing. Definitely enjoyed our stay! Was in a good location. Far enough away from town, but not too far out. Comfortable! Nice flatscreens in the living room and all bedrooms with satellite. Perfect for our trip! The only problem we had was the porch swing. The chain in the back makes the swing tilt too far and you fall out when trying to get out of it. Other than that small detail it was great! Thank you for taking the time to let us know about your recent stay in Oakland #1! We here at Cabins USA strive to give each of our guests the best stay possible while vacationing in the Smokies. Thank you for letting us know about the porch swing. Your comments have been forwarded to our maintenance department to be addressed. When you are ready to stay with us again, please mention you are a return guest for an additional discount. Thank you for choosing Cabins USA and we look forward to having you as our guest again soon! The gas heat had a leak that they couldn't get fixed and we tried to stay cause we didn't figure we would need the heat. However the water heater is also powered by gas therefore we didn't have any hot water. Cabins USA moved us to another cabin and it was beautiful, just not as secluded as Oakland 1. The service was very prompt getting us moved and into another place. Staff had "oh well" attitude about problems that occurred during power outage. Not a problem solving attitude. Staff was helpful with reoccurring alarm problems. Warning that toilets would not work during outage. That water had to be purchased to make them work. No suggestion as were to buy water. Got to store just as they were closing. Staff did not generate a list of alternative lodging and offer it to guests. I had a medical device that required power and staff did not have any resources to offer. Cabin was beautiful for the one day we had power. We absolutely loved this cabin and the staff at Cabins USA. In fact we plan on booking this exact same cabin for our annual trip next year! We ended duplicate having reservations the weekend after the massive wildfires in gatlinburg and parts of pigeon forge. Had trouble getting in touch with the company on multiple occasions but understandable due to the massive flow of calls and messages they were receiving. We still made the trip and had a blast. Our biggest complaints were the lack of things in the cabin. ONE hand towel. Nothing to wipe dishes down with before putting in the dishwasher. Jacuzzi tub didn't work. Not enough silverware for the 9 people in the cabin. Little things like that. We stI'll enjoyed our stay and will use cabins usa for future reservations. Thank you for taking the time to let us know about your recent stay in Oakland #1! We here at Cabins USA work hard to make sure each of our guests have the same great stay you enjoyed while vacationing in the Smokies. Due to the recent fires, we did experience and extremely high call volume and I apologize for the difficulties you encountered when trying to reach the office. Thank you for letting us know about the Jacuzzi as well as the lack of silverware and towels. Those have been forwarded to our maintenance and housekeeping departments to be addressed. When you are ready to stay with us again, please mention you are a return guest for an additional discount. Thank you for choosing Cabins USA and we look forward to having you as our guest again! We were in Oakland 1 Monday night when the fires started. Lights went out 8:30 that night and no water. We talked with office staff and decided to leave on Tuesday and come back some other time. We've stayed in same cabin before and love it. Thank you for taking the time to let us know about your recent stay in Oakland #1! The fires we recently experienced was a difficult time for everyone in our area and we here at Cabins USA work hard to make sure each of our guests had the best stay possible. When you are ready to stay with us again, please mention you are a return guest for an additional discount. Thank you again for your review and thank you for choosing Cabins USA! The only issue we had is that the dishwasher flooded the first time we used it. Called USA and they sent maintance right out but unfortunately he could not repair it at that time. Since we BBQ'd every night that was a lot of dishes by hand. And they need to fix the picnic table. Other than that it was a nice cabin. Great parking and location in the Arts and craft community. Thank you for taking the time to let us know about your recent stay in Oakland #1! We here at Cabins USA work hard to make sure each of our guests have the same great stay you enjoyed while vacationing in the Smokies. I apologize for the issues you experienced with the dishwasher. Maintenance has been notified and will be correcting that issue. When you are ready to stay with us again, please mention you are a return guest for an additional discount. Thank you again for your review and thank you for choosing Cabins USA! Not enough towels for 6 people. Dish washer leaks water on floor. Washed dishes by hand. Had trouble with front burner on stove. Wouldn't hold heat. We had a wonderful time! The fire pit out back was an added bonus that was greatly appreciated. We will definitely be back. For the price, this cabin can't be beat! Amazing location, quiet, clean and comfortable! And the check-in/out process was a breeze! I will definitely be staying with Cabins USA again! This cabin was perfect for our family vacation! The checking/check out process was simple and the property was beautiful. Can't wait to go back, will definitely use USA Cabins again in the future!! Thank you for all of your kind words! We here at Cabins USA work hard to make sure each of our guests have the same great stay while vacationing in the Smokies. When you are ready to stay with us again, please mention you are a return guest for an additional discount. Thank you again for your review and thank you for choosing Cabins USA! Was a great stay.my family enjoyed themselves. Liked the arcade. Carpet was a little dirty I spot cleaned some stains. Could ise,some more pot holders for cooking. Staff came and fixed Internet after storm. Was comfortable and like home . Thank you for all of your kind words! We here at Cabins USA work hard to make sure each of our guests have the same great stay you enjoyed while vacationing in the Smokies. Thank you for letting us know about the carpet. Maintenance has been notified and will be working to correct. When you are ready to stay with us again, please mention you are a return guest for an additional discount. Thank you again for your review and we look forward to having you as our guest again! The best part of Oakland #1 is the location! It is remote-ish and secluded so you don't hear or see traffic. It's wooded so there's only a little direct sunlight. From the outside it looks terrific. On the inside it could stand a little updating: the lighting is terrible, the jacuzzi tub in the living room is ridiculous . . . this is a three bedroom cabin, not a honeymoon cabin. It's weird and a waste of space. The kitchen is huge and decently stocked (it could stand to have a few more items) Nearly all the cabinets are empty because it's so large. The stove is inconsistent when heating so be careful. Again the lighting is horrible throughout the cabin. The wireless internet is not adequate (you certainly could not stream a movie on a rainy day or late night). I had difficulty with my email anywhere in the cabin other than the livingroom. It's a shame it's so poor because there is nearly no cell signal in the house. Overall we enjoyed our stay and found the cabin comfortable though it took about 24 hours for it to grow on us. Our family stayed here and we absolutely loved this cabin! It was beautiful and very comfortable for our stay. The cabin was easy to get to and just far enough away that it was the most beautiful and peaceful vacation our family has ever experienced. It definitely felt like a home away from home. Every thing we needed was right there in the cabin, which made the stay that more enjoyable. The wildlife we saw while there was also an experience to remember. Each morning we saw a family of turkeys and their small babies walk across the drive way. We would highly recommend this cabin, Oakland 1, to all our family and friends. Already looking forward to our next vacation there. Thank you! This cabin is really secluded. Road is small going to it but never met a vehicle. Had trouble with TVs but maintenance came and my husband and maintenance repaired problem. Cabin was really nicely furnished and included a packman game, etc. The only concern is no telephone but cells worked in that area. For someone with no phone it would create a problem. Will return sometime. Thank you for taking the time to let us know about ! We here at Cabins USA work hard to make sure each of our guests have the best stay possible while vacationing in the Smokies. When you are ready to stay with us again, please mention you are a return guest for an additional discount. Thank you for choosing Cabins USA and we look forward to having you as our guest again! We really enjoyed this cabin! The location was great and we loved how private it was. The only complaint that I have is that the hot tub wouldn't get hot. It stayed around 83 degrees so we didn't get to enjoy it. Other than that everything was good and we will stay here again! Thank you for taking the time to let us know about your recent stay in Oakland #1! We here at Cabins USA work hard to make sure each of our guests have the same great stay you enjoyed while visiting the Smokies. I apologize for the issue you experienced with the hot tub. Maintenance has been notified and will be working to correct that. When you are ready to stay with us again, please mention you are a return guest for an additional discount. Thank you for choosing Cabins USA and we look forward to having you as our guest again! We absolutely loved the location of this cabin! It was conveniently located close to downtown Gatlinburg and Pigeon Forge but still had that Smokey Mountain secluded feel. The cabin itself was really nice and cozy and definitely had more than enough room for all of us. It had plenty of pots and pans, dishes, and appliances. In the evening after grilling on the charcoal grill in the backyard, it was wonderful to sit around a campfire, then get into the hot tub. Thank you for giving us such a memorable vacation in Gatlinburg. I would definitely recommend staying at this cabin if you want to be close to the action but far away enough to enjoy nature. Thank you for taking the time to let us know about your stay in Oakland #1 and I am so happy to hear that you enjoyed your cabin. We work hard to make sure that each of our guests have the same great experience you did while visiting the Smokies. Thank your letting us know about the issue with the lawn. Maintenance has been notified and that will be taking care of. Thank you again for your review and we look forward to having you as our guest again! Our stay at Oakland #1 was great. The cabin was spacious, comfortable and had everything we needed. The porch with hot tub and swing was wonderful and we spent every night out there. My only suggestions for improvement are very small ones...towel racks or hooks in the bathrooms and clothes hangers for the closets would be great. We also had friends stay with us in Oakland #2 and we were disappointed that the cabin was so far and up such a steep incline. We were not able to walk between cabins. When I had called to ask about the distance between the cabins before booking them I was told they were absolutely within walking distance which they are clearly not. We were disappointed with that since we had to drive back and forth. My suggestion when advertising the Oakland cabins would be to make sure the renters are aware that they are up very steep, winding roads in case they are not comfortable with those conditions. We had a 24 foot motorcycle trailer with us so if we had rented cabin 3 and 4 we would not have been able to get the trailer up there. Just a couple of suggestions for you! Thank you for taking the time to let us know about your stay in Oakland #1! I have forwarded your suggestions on to our owner liaisons and they will be speaking with the owner of the cabin about them. When you are ready to make reservations again, please let them know you are a return guest for an additional discount. Thank you again for your review and thank you for choosing Cabins USA! We enjoyed our stay at the Oakland #1.. Plenty of space and surprisingly close to grocery. We will come back to Cabins USA and would like to experience different locations they have to offer. Only thing I wish we could change was the lack of view at the cabin. I knew we opted for a cabin that was secluded but I thought we would still have some type of view. I am so happy to hear that you enjoyed your stay in Oakland #1. We not only have private cabins but also cabins with great views! Please feel free to contact one of our reservationists when you're ready to start planning your next trip to the Smokies and they can help you find a cabin with a spectacular view! Thank you for choosing Cabins USA and we look forward to having you as our guest again! This was our honeymoon first landing stop. We were provided typed directions as we were told is difficult to find at night. We learned there must have been a typo following many miles to find a non existent road called: 'Tro Way'. Look for Oakland Way on the left. On arrival we were very pleased. Comical when bringing in items a bird decided to come in and stay the night with us, singing us to sleep. We needed that help as the downstairs bed was very difficult to sleep in. Thankful for the Jacuzzi the next morning! We decided to try #2 bed upstairs with the TV, well...again, thankful for the Jacuzzi. On our third night we found #3 bed was where we found restful sleep yet still would recommend replacement following a few more nights in it. The amenities were limited yet useful. I would suggest to pack as if you're camping. Loved the nature, the porch swing and of course I say again, The Jacuzzi! We did hear voices from up above us however never saw anyone. Was visited by a wild turkey with three lil' hatchlings following along as she plucked wild berries; very sweet experience. All in all the cabin was clean and well kept. The couch was not all that comfortable yet did not spend very much time watching the limited channels on the TV. We would definitely return for the scenery and seclusion - making an outdoor fire and dining on the picnic table oh again the Jacuzzi-the fire flies at night were amazing to watch. Perhaps add pillow top covers or flip the beds so you don't sink to the middle, that is if your effort is to find a more economical way to provide comfort for your over night guests? Upon arrival the cabin was clean and well maintained. I read in previous reviews a lot of negativity. No towels, only one pot, etc. There were brand new pots in the cabin, more than enough towels. Our stay was awesome. There was no WiFi or cell signal, but it was great to disconnect from the world and reconnect with the family. If you are looking for privacy away from the world, this is the cabin for you. We have booked again for July and can not wait!!!! One of the bedrooms was not clean on arrival, along with 2 bathrooms. The bed was unmade and dirty towels in bathroom. This was reported and taken care of immediately. Quiet, clean and secluded cabin. It slept 4 adults and 6 kids comfortably. There are a few cabins further up the hill, but we weren't able to hear anyone. No shortage of hot water. About a 10 minute drive to the nearest grocery,15 to downtown Gatlinburg and 30 to Pigeon Forge (due to heavy traffic). Grocery was well stocked with all that we needed to cook for the week. Pots and pans are slim, so don't plan on making a large dinner. Local pizza place says they deliver. Stove runs hot and only one burner worked, but we were able to make a few meals and baked goods anyway. We all had cell phone service there with Verizon, but no WiFi and limited TV channels. Wonderful gas fireplace, outside grill and fire pit - we enjoyed using them all! Couches could be replaced. Staff upon check-in were all very polite and even called to check up on us the first day of our stay to see if there was anything they could do for us. Overall, we had a wonderful, relaxing vacation and would definitely rent this cabin again! Thank you! Thank you for your taking the time to write your review. We are delighted that you enjoyed your stay with us at Oakland #1. We appreciate your feedback on your stay with us. We take our guests thoughts and issues very seriously and will always strive to improve every guests experience. We hope that we will hear from you again soon. Do not forget about our return guest discount. We love it .It was a great place for relaxing and noise free . WE are planing another trip really soon . Cabin was beautiful and super-clean. Living room furniture needs replaced--foot rest on recliner broken, couch lumpy and low. I slept in the queen-sized bed upstairs; it was adequate but could have been better. Cookware was scanty--no pot big enough to cook mac 'n' cheese. No pitcher for ice tea but I used the coffee pot. Swing was difficult to sit in because front was lower than back which meant I slid out. Cabin is not far off a main road and near artists' shops which was convenient. Ramp end of porch makes access super-easy for older adults. Hot tub was fantastic although the cover requires two able-bodied people to handle it. I enjoyed the night sounds since the weather was cool enough that we did not use the AC. Since the visit was to visit my niece's grandsons, we had teenagers part of the time; they enjoyed the outside and the foose ball but were disappointed at the lack of pool sticks. Upstairs commode stopped up, but serviceman arrived within an hour of notification. Peace and quiet were exceptional. Despite the above complaints, the cabin was a good value for the area and I'd rent it again. Far in the mountains,which we loved!!! Cabin needed some repairs: (blinds broken on doors and did not cover glass on door) Bathroom door need adjusted. It would not close. Cabin was not completely clean. (found potato chip bag under bed & used paper towels behind night stand. Dish washer not secured. Screws on top to hold it in place were not used. Two people had to load dishwasher because it would fall forward if not. We enjoyed our stay, the cabin was nice and clean. The staff were helpful. Nice quiet location. I would book a stay at this location again. We loved the cabin! It was clean, quiet, had everything we needed, and was in a beautiful location. The cost was very affordable when we divided it between three couples. The only criticism is that it would have been nice if the cabin had wifi, but maybe being disconnected for a few days was a good thing. Thank you for your review. We are delighted that you loved your stay with us at Oakland #1. We apologize if you were in inconvenienced during your stay due to no internet access at the cabin. We hope that we hear from you again soon. Feel free to give us a call and allow us to help you find the perfect cabin with internet access. Was a wonderful vacation. Cabin is not fancy, but extremely comfortable. Has everything you need to a nice relaxing vacation. In the middle of Arts and Crafts Loop. AWESOME, Very secluded, we could hear people a couple of times, but never seen anyone. Had a raccoon that visited every evening and at end of driveway there is a groundhog. Would definitely recommend this to anyone. 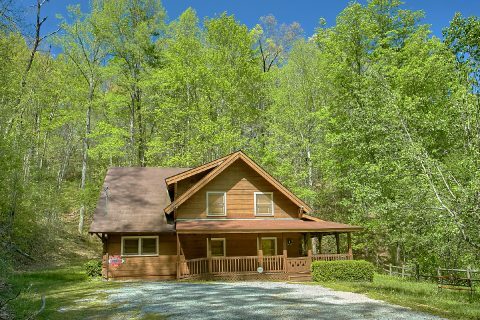 Very clean, close to Gatlinburg, grocery store and gas stations on the way to cabin, very convenient. The only complaint I would have was that the trash cans on porch did not lock. Due to our evening raccoon company, we had to move the trash cans in the cabin. Not a real problem, but would be nice to leave it outside. Thanks again for making our first girls vacation a hit. On the way home already planning for next year! Thank you for your review. We apologize for the issues that you experienced during your stay. We were able to fix all of these issues after your stay. We hope that we will be hearing from you again soon. We really enjoyed our stay at the Oakland #1, it was very secluded and quiet which we were looking for. The price was very reasonable. I would suggest putting a better sign at the end of the driveway it was very difficult to find our first night. The cabin could really use some new furniture and carpet. Overall we enjoyed our stay and had a good time. Would book it again. the place was really good, nice secluded cabin with all the amenities. customer service was okay, not great. Thank you for choosing Cabins USA Gatlinburg. We are happy to see that you enjoyed your stay in Oakland #1. Cabins USA Gatlinburg strives to provide each guest with an excellent cabin experience as well as customer service. We apologize if you feel you didn't receive the highest level of customer service. We hope that you will stay with us again soon and give us another opportunity to provide you and your family with excellent service. We booked a different cabin(bear T ful) and couldn't reach it becoz the vehicle couldn't pull up the hill.Believe me, the road up the mountain to the cabin we booked was a scary ! I'm sure the view was rewarding but we never reached it. When we informed the cabin staff they were understanding and promptly directed us to this cabin which was not up on a hill...The cabin we got was clean ,comfortable and had basic amenities and we had a great time there , thanks!!! The only set back was no internet connection and our phones (AT&T) did not have any signal.Other than that we are completely satisfied with the service. Thank you for staying with Cabins USA Gatlinburg. We are happy to see that even though your stay started out a little bumpy you enjoyed the cabin Oakland #1. We hope that you will stay with us again so that you can experience some of our other cabins on the program. We hope to see you soon.